Can a note be excluded from the daily report? 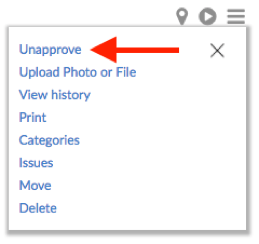 If a note was taken that you want to save for your records, but do not want it to appear on the Daily Report, you can "unapprove" this note to exclude it from the report. From the project selector dropdown menu at the top of the page, click on the project that the note is on.